Dr. Melissa E. Heche is the Doctor of Audiology and Clinical Voice and Swallowing Pathologist of New York Speech and Hearing. She is dually certified in audiology and speech pathology; she has a unique background in music, performance and sound engineering. Her background allows for a distinctive view on sound interpretation and its impact on communication. Dr. Heche specializes in the assessment and treatment of hearing/auditory disorders, tinnitus, and of voice/vocal fold and swallowing disorders. She is a licensed hearing aid dispenser and uses a whole communication approach to hearing aid dispensing. She provides active hearing conservation programs – particularly within the music industry. Dr. Heche works closely with the musical and performance community, addressing the needs of musicians and vocalists. She provides seminars regarding vocal health practices to public speakers. She also offers the service of accent reduction for people who speak English as a second language and accent acquisition for actors who may need to learn alternate speech patterns. 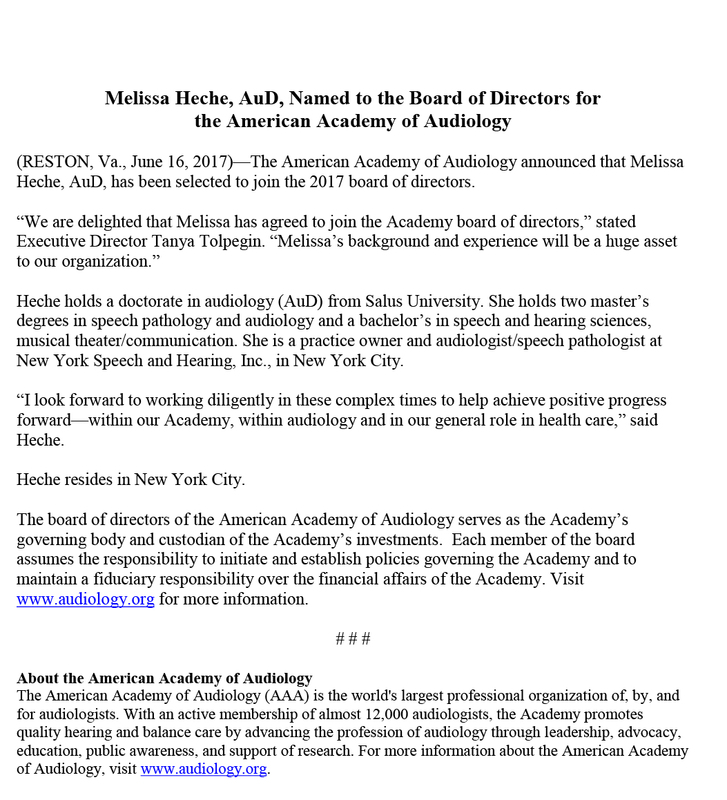 Dr. Melissa E. Heche begins a term on the American Academy of Audiology Board of Directors! Helping to shape the future of Audiology & improve access to Hearing Healthcare. Click here for press release. Doctor of Audiology, Salus University. Masters Degrees in Audiology & Speech Pathology, Hofstra University. Lindsay Beckler is a 3rd year doctoral student at the LI Audiology Consortium: Adelphi, Hofstra, & St. John’s University. She completed her Bachelor of Arts in Speech-Language & Hearing Sciences at Hofstra University in 2015. As a doctoral candidate, Lindsay has completed clinical externship rotations at all three collaborating universities, at a prominent ENT practice and at a private practice on Long Island prior to her current and final rotation at New York Speech and Hearing. She will be completing her 4th year at a private practice on LI. In her time as a graduate student, she developed a personal interest in working with adults/geriatrics by performing diagnostic hearing evaluations and fitting patients with appropriate hearing devices. She is an active member of the Student Academy of Audiology, and has attended both the Oticon Summer Camp and Starkey University to further advance her knowledge of the latest developments in hearing aid technology. Born and raised on eastern Long Island, she spends her free time taking advantage of the best LI has to offer, including its beaches in the summer and vineyards in the fall. Lindsay spends a lot of time traveling and following her favorite musicians across the country – and loves nothing more than live music. These qualities make Lindsey a unique addition to New York Speech and Hearing, providing clinical services within her realm of interest and experience.